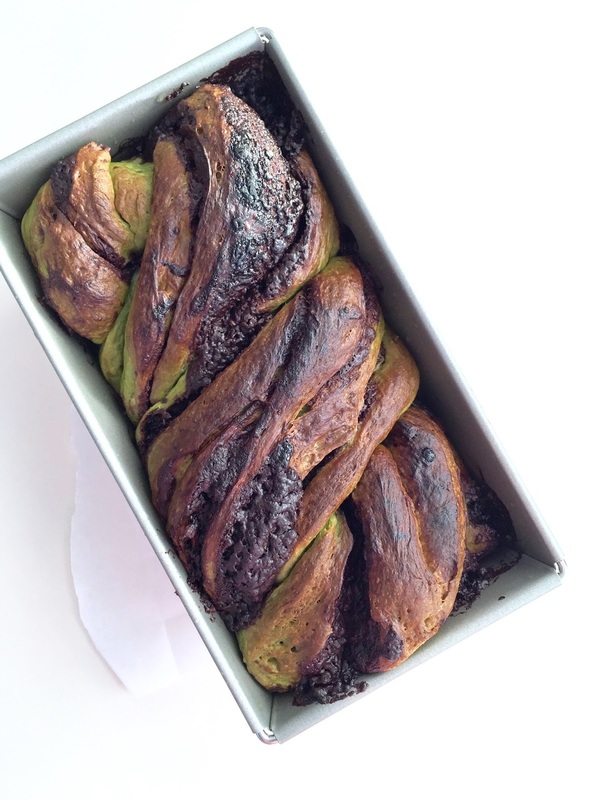 Crumbs and Cookies: matcha chocolate babka. 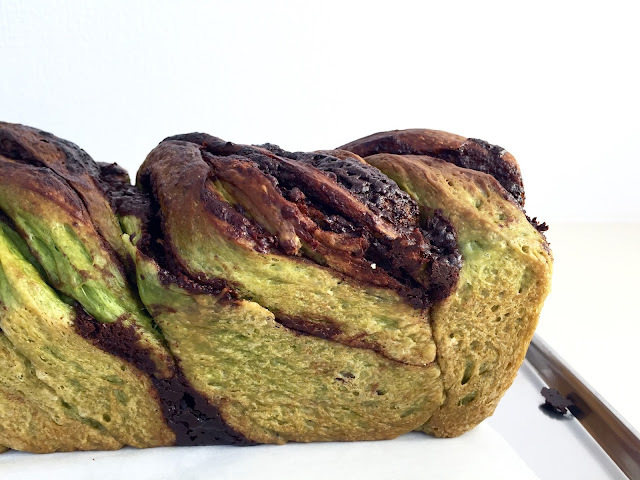 The matcha ideas never seem to stop coming! 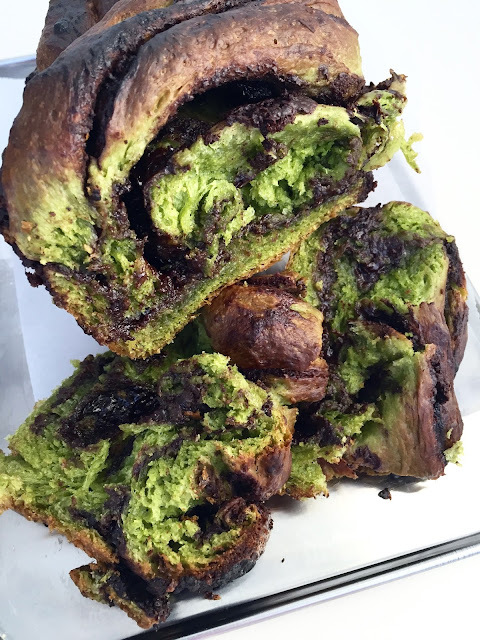 I guess this is to be expected - after all, where else but the home to enough matcha lattes to supply an asian parallel of Willy Wonka's chocolate river would have the capacity to inspire a limitless amount of matcha creations with it's own impressive assortment? 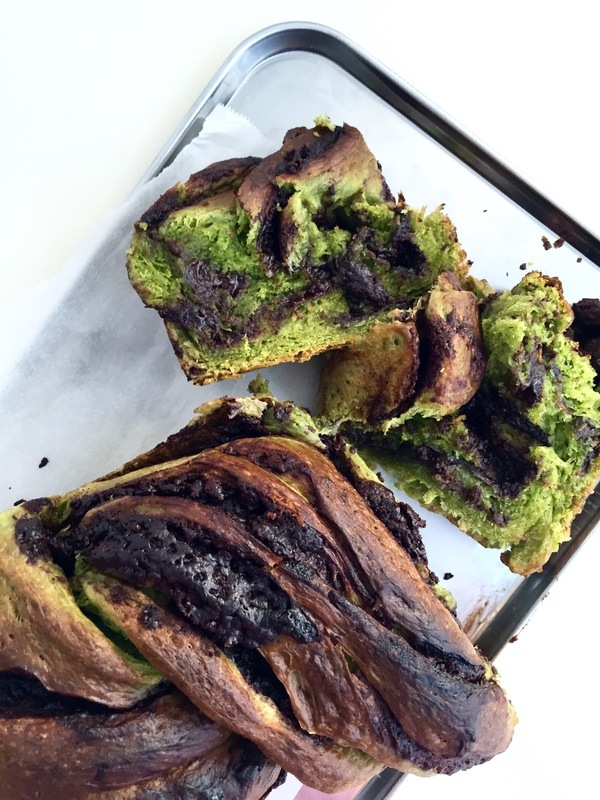 To begin with, I would like to say that my initial plan was to do more than just adding matcha powder to the dough. I also wanted to incorporate into the filling some matcha chocolate that I can say with absolute confidence existed, but was nowhere to be found when I really needed it. There just has to be some sort of theory explaining this phenomenon, like a more specific version of Murphy's Law. My attempt at spreading the chocolate paste evenly and braiding the loaf was somewhat disastrous and that resulted in rather weirdly interspersed pools of chocolate as opposed to the uniform swirls I was trying to achieve, but who would deny teeth-staining mouthfuls of chocolate right? And besides, brown lipstick is making it's comeback. First babka down, many more to come. Make the dough: Combine the flour, matcha powder, sugar and yeast in the bottom of the bowl of a stand mixer. Add the eggs and water, mixing with the dough hook until it comes together. With the mixer on low, add the salt, then the butter a spoonful at a time, mixing until it's incorporated into the dough. Mix on medium speed for 10 minutes until the dough is completely smooth. Place the dough in a lightly oiled bowl, cover with plastic wrap and refrigerate. Leave in fridge for at least half a day, preferable overnight. If you want to speed up the process, let the dough double at room temperature then refrigerate for at least 30 minutes for the dough to firm up. This makes the shaping process considerably easier and less messy. Make the filling: Melt the butter and chocolate together until smooth. Stir in powdered sugar and cocoa powder; mixture should form a spreadable paste. Assemble the loaf: Coat a 9 x 4 inch loaf pan with oil or butter and line the bottom of each with a rectangle of parchment paper (which I didn't - oops). Retrieve dough from fridge and roll out into a rectangle of roughly 10 by 12 inches. Spread the chocolate mixture evenly over the dough, leaving a 1/2 inch border all around. Roll up the dough into a log and trim the last 1/2 inch off each end of the log. Slice 1/2 inch off each end of the log and slice it into half lengthwise. Lay the halves next to each other on the counter; pinch the top ends gently together. Lift one side over the other, forming a twist and trying to keep the cut sides facing out. Transfer into the prepared loaf pan. Cover with a damp tea towel and leave to rise for another 1 to 1/2 hours at room temperature. Preheat oven to 375F. Bake for roughly 30 minutes. If the babka browns too quickly halfway through baking cover with foil. While the babka is baking, make the syrup: Bring sugar and water to a simmer until sugar dissolves. Remove from heat and set aside to cool somewhat. As soon as the babka leaves the oven, brush the syrup all over. Let the babka cool halfway in the pan then transfer to a cooling rack to cool the rest of the way before eating. cheesecake brownie "ice cream" pops.